to get that excited) because the meal was kind of a bust. their sending back food and demanding nature cancelled out our service altogether. this a Dear FloFab candidate?). 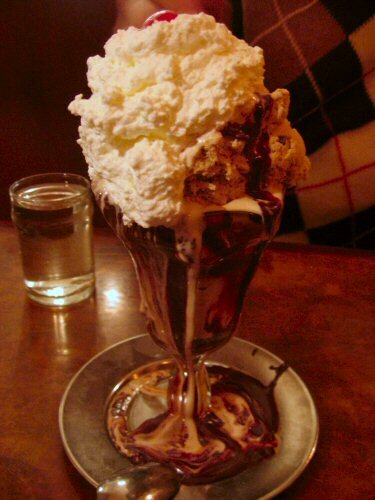 big fat sundae to raise my spirits. Where? Indeed, it was, and quite close to Park Avenue Summer. Ok, I'd play tourist. whole thing, but a right-on night-saver. 1/2 Two things I like about vacations are drinking in the middle of the day and eating lots of sweets. My dull workaday life is sugar-free, and cocktails are relegated to the weekends. I satisfied both loves my first day in San Francisco, a Saturday when good foodies are supposed to be at the Ferry Plaza Farmers Market, when instead, I met up with an old Portland friend who now lives in the Mission. He was already acquainted with popular ice creamery, Bi-Rite, so we chose to immerse ourselves in weirder flavors at Humphry Slocombe. We all were swayed by Secret Breakfast, a wink-wink blend of cornflakes and Jim Beam. Second scoops included Peanut Butter Curry for me, which tasted as advertised and had the bluntness of turmeric-heavy curry powder; Olive Oil for Todd, which he said was orangey, not olivey; and a mistaken Salt and Pepper for James (he’d ask for Cayenne Cantaloupe and I screwed up the order because my brain couldn’t retain three combos of two). The unexpected thing was that the flavors weren’t wildly distinct. I don’t think I would’ve guessed either of the two ingredients in the Secret Breakfast, which was more creamy and vanilla-ish. The cracked pepper definitely stood out because I thought it was my bowl and not the curry flavor I’d been expecting. However, I didn’t taste any salt and would’ve liked the contrast. I don’t think we converted Todd from Bi Rite, but I’d give Humphry another chance if I lived nearby. Plus, the prosciutto flavor is back on the menu today. Odd for someone who eats ice cream like never, I also had a scoop of nectarine at brand new Mission Hill Creamery in Santa Cruz, a company started by my boyfriend’s sister’s husband’s childhood friend. Apparently, he is of the same purist, seasonal school as Bi Rite and learned from the same master somewhere in the Northeast. I thought it was interesting that he claimed that Humphry Slocombe quirks wouldn’t fly in Santa Cruz. I was just reading about a place in Maine, which strikes me as a more conservative locale, doing flavors like Thai Chile and Chocolate Wasabi, so you never know. I did not take any photos because I tend to reserve food paparazzi behavior for company who is used to it. I wasn’t sure if Dirty Thieves, around the corner from Humphry Slocombe, was a true dive or a facsimile, but the booths were ripped up enough and while PBR tallboys and a shot of whiskey are hip in their own way, it’s not like housemade horehound bitters and lavender-infused Plymouth Gin. In fact, my long list of to-try mixology dens (Albemic, Bar Agricole, Comstock Saloon, Smuggler’s Cove, Hogs & Rocks, Beretta, among others) completely got top shelved once I set foot in San Francisco. Instead, we mingled with tourists swaying to Ray Charles covers banged out on the corner piano at Gold Dust Lounge, and nursed a few beers at Li Po on a Labor Day night in Chinatown so silent we tried not to disrupt the homeless man sleeping in the doorway next to where we parked. He continued his buzzsaw snoring, perhaps the only thing keeping Lo Pan, who we kept imagining would float by in the dark, at bay. I also couldn’t pass up Eddie Rickenbacker’s, a prototypical fern bar of the let’s put crap and Tiffany lamps all over the place school of décor that only now Applebee’s and Ruby Tuesdays are trying to move away from. We really wanted to see Mr. Higgins, the obese, three-legged Katrina rescued cat who lives in the bar, but he’d died three weeks prior to the date we arrived to say hi. I drank a shot of Maker’s Mark in his honor, though he was probably more of a Harvey Wallbanger feline. Dirty Thieves continued the refreshing San Francisco tradition of warm service, irony-rich PBR or not, an antidote to the dourness I’ve just come to expect as normal in Brooklyn. In fact, our bartender was so friendly he practically apologized for not offering us free peanut butter and banana sandwiches that he’d been grilling out back. Full of Mayan food (another post) and ice cream, we still couldn’t turn down such kindness—and enthusiasm—it was as if he’d invented the combination himself. Why does no one in the Bay Area have webpages? Neither of us had seen The Departed (which was intentional in my case) and it was still lingering at the moderately artsy/cheap theater in Forest Hills. I couldn’t picture where it was but as we started heading up Metropolitan Avenue I realized where we were and instantly remembered that Eddie’s Sweet Shop is right across the street from the movies. And miraculously there was an open parking spot on the corner, putting us spitting distance from both establishments. We had 45 minutes until the 8:15 pm show time and I figured anyone who would’ve wanted to see this movie had already seen it so no stress on snagging seats (I was wrong, the theater was quite full. We were also easily the two youngest viewers in the audience. And for the record, old people are just barely less vocal and distracting than the rowdy teens who dominate the Court Street multiplex near me). We totally had enough time to split a sundae. Eddie’s hadn’t changed a bit since my first and most recent visit nearly six and a half years ago (reminders of the swift passing of time completely freak me out). It was still manned by wholesome looking teens, old-timey and trinket-filled. 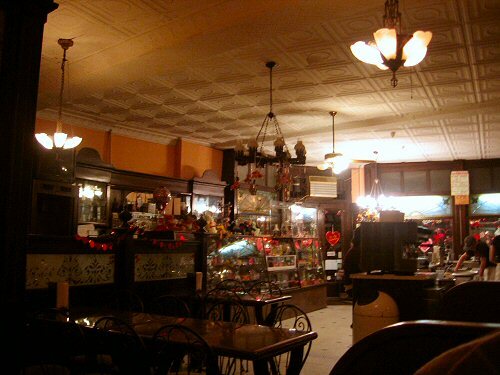 The number of soda fountains with counter stools and spindly curlicue chairs is rapidly dwindling. Modernly garish Coldstone Creamery has more appeal, I guess. They don't burst into song at Eddie's, though they do play an '80s radio station. I honestly don't know which is more wrong. I find it hard to slow down and enjoy things properly so I struggled to savor my surroundings and scoops of ice cream. Surprisingly, it was James that said, “I don’t think I’m appreciating this,” which was an odd observation. I tried to concentrate and take in our shared creamy butter pecan, coffee chip and overflowing hot fudge before it melted. It’s funny that my initial inclination was to order a butter pecan and butterscotch sundae since apparently that’s what I ordered on my last visit (see, this blog is good for something, after all). The perfect accompaniment was a short glass of water. I didn’t even have to ask, the young waitress offered, “I like water with hot fudge.” True, ice water and hot fudge is a great combo. combo) and sweet potato fries. Both were tasty, but they were not beignets. I don't know about that European street food.